French police have released a photo of the suspect who is still at large from the Friday night attack on Paris that killed at least 132 people. He is identified as Salah Abdeslam, a 26-year-old man born in Brussels, Belgium. The posting soliciting information about the so-called eighth suspect warns that he is dangerous and that anyone with information should call authorities. He is one of three brothers linked to the string of near-simultaneous attacks across Paris Friday night. Another brother – Ibrahim Salah – blew himself up at the Bataclan music hall, during an attack there that killed more than 80 people. Belgium authorities are detaining the third brother. Police in both France and Belgium have have made several arrests and are also questioning family members and other people linked to the other suspected assailants. French police Sunday questioned close relatives of Omar Ismail Mostefai, the first terrorist identified in attack. Mostefai’s father, brother and sister-in-law were among six people the authorities detained as France observed the first of three days of national mourning in the aftermath of the carnage that has shocked the world. Mostefai was one of seven attackers, all of them wearing suicide vests packed with explosives, who died during the simultaneous attacks, with six of them blowing themselves up and the seventh killed in a shootout with police. At least three of the seven were French nationals. French prosecutor Francois Molins said Mostefai was known to police as a petty criminal, but had “never been implicated in an investigation or a terrorist association.” The 29-year-old Mostefai lived in Chartres, near Paris. The Place de la Republique in Paris has filled back up with people after a panic attack sent them running, according to VOA’s Daniel Schearf. Schearf said he was shooting video footage at the square where a crowd of about 2,000 had gathered mostly to mourn although a small group was showing defiance and singing. A scream was heard somewhere at the center of the crowd and as he heard more screams people panicked and ran, emptying the square in a matter of moments. The Associated Press reports that the crowd was spooked by several fire crackers. Student Thomas Deblauwe and his father were at Republique square earlier in the day, where a crowd placed flowers and candles in front of a giant statue of Marianne, the symbol of France. Deblauwe said it was important that French stand together and support each other. 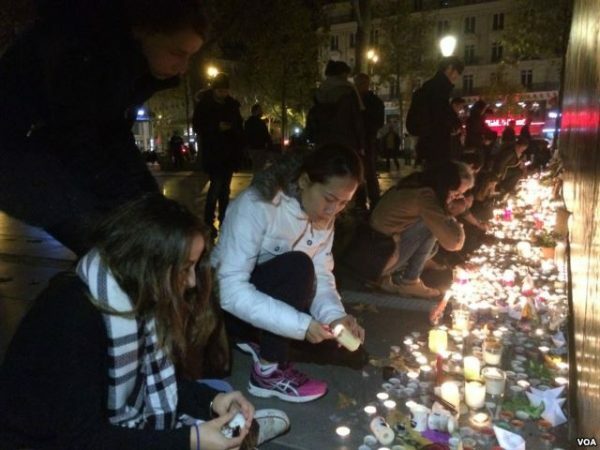 The country will observe another minute of silence on Monday to pay hommage to the victims. 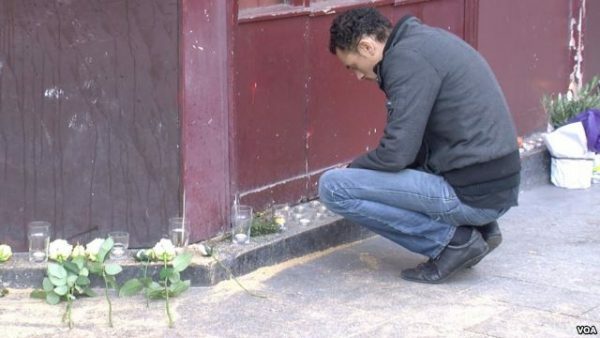 France is marking three days of mourning for the victims who include more than 350 wounded. Hundreds of people packed Notre Dame Cathedral for an evening mass. French President Francois Hollande said the attacks, claimed by the Islamic State group, amounted to an “act of war” against his country, and he feared terrorists may be planning more attacks. In its claim of responsibility, Islamic State lashed out at the countries trying to suppress its attempt to establish a “caliphate” in Syria and Iraq, and said France remains “at the top” of its list of preferred targets.